Join me for an exciting five days of landscape photography in the fantastic deserts of the southwest. Experience some of America’s most dramatic landscapes offering limitless possibilities for the creative photographer. 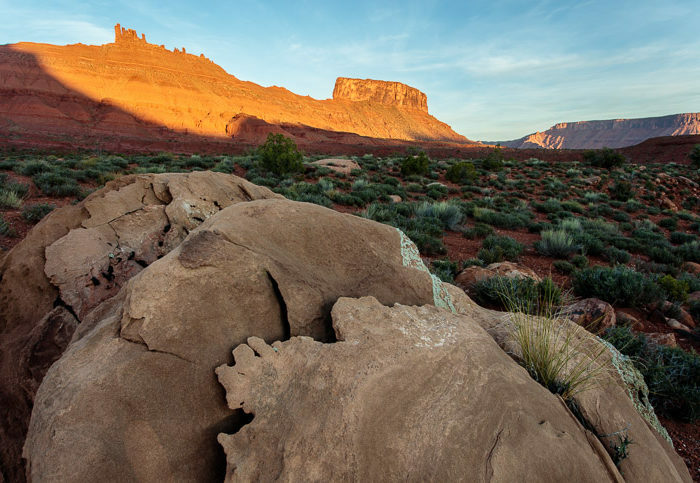 We’ll be headquartered in Moab, Utah, which offers easy access to awe inspiring beauty, fantastic rock formations, incredible variety of terrain, and light that never fails to inspire. I have over a decade of experience in the area and so we’ll be visiting many lesser known locations off the beaten path. We’ll also visit a select few in Arches and Canyonlands National Parks. My goal is to inspire your creative spirit, help you gain confidence, improve your vision, and push you to grow as a nature photographer. Because of that, this workshop is limited to just five students for optimal quality time and interaction with me, your instructor. I love teaching and working with other photographers – plain and simple. And you’ll see that each day of the workshop. On our daily field outings, we’ll work together to help you gain confidence with your composition, technique, and ability to convey your personal vision. This workshop is primarily about growth and vision. Of course you will have the opportunity to make many great images, but the focus is on pushing beyond your comfort zone to expand your visual potential. The techniques we cover in the field will be reinforced in the classroom, helping you improve while still on location. We’ll spend time developing images in Lightroom 6, cover many compositional skills, and learn from each other during photo critiques. This workshop is designed for serious photographers – beginner to advanced – who want to improve and expand their creative potential. Regardless of your experience, this workshop will give you the opportunity to work closely with a passionate professional dedicated to helping you develop your personal vision. Laptop computer with Lightroom higher is highly recommended. 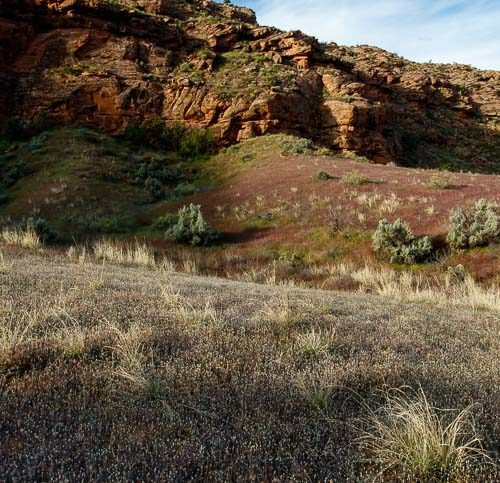 Participants must be in good physical condition and be able to hike 2-3 miles with photo gear over uneven terrain. Safety is always my priority, so If you have any questions or concerns, please contact me for more information. We’ll be headquartered at the Moab Valley Inn, Moab Utah. 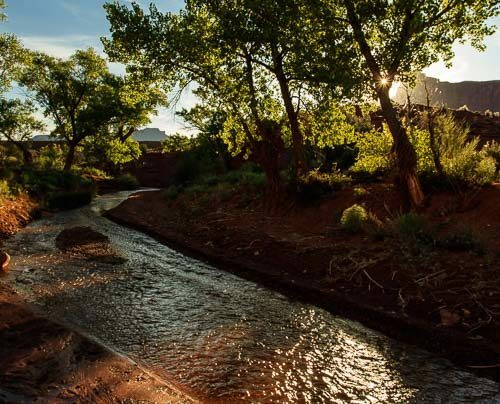 Moab is a great adventure town with a myriad of dining and shopping options. Lodging and food are not included in the workshop fee, but I have reserved six rooms for students. Download the Workshop Guide for more info! 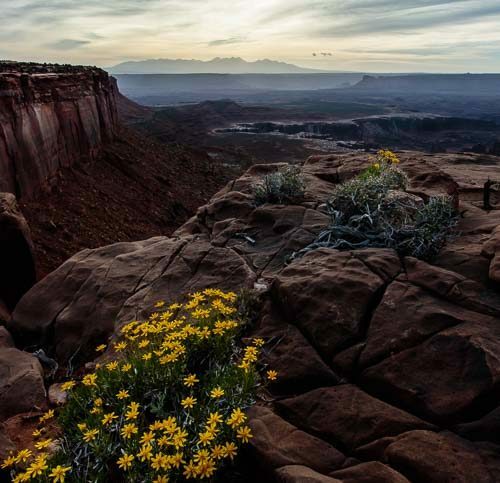 “After the first day of the Spring in Arches and Canyonlands workshop, my wife, Judy, and I knew we were in for something special. These two national parks and the surrounding areas were unique and as beautiful as any I had ever been to. The photographic opportunities were endless and Robert’s intimate knowledge of the area and planning before we got there allowed us to maximize the use of our time. Rising hours before sunrise and finishing the day after the sun had set was a commitment happily made by everyone in the group, nice easygoing people from many walks of life who shared a common goal. That was to enjoy the time and the place and to make better images. As hard as we worked, Robert worked just as hard or harder, both in the classroom and in the field. Robert has often talked and written that it’s okay to fail in the process of learning. I am old enough to be cynical when people say things like that. But it was true. While I failed many times, particularly during the first two or three days, Robert was always there to help and encourage, but never to criticize in any negative way. And when that proverbial light bulb finally went off and my pictures began to reflect many of the things Robert had been drumming into our heads, I realized how much I had learned in such a short, but intense period of time. I had become more of a master of my equipment instead of the other way around. Robert helped me learn how to see and find images that had previously been invisible to me. And, starting from scratch on the first day, I learned enough about Lightroom to get the most out of the images I had made. Because of watching his videos, I chose to attend his Moab workshop in May. It was a phenomenal workshop! I have previously been on workshops in Colorado, one with a nationally recognized photographer-and have been disappointed. Robert’s approach to photography and his approach to educating others is very definitely a gift. I learned a great deal. It was a total immersion in the theory of seeing. He excels in paying individual attention to his workshop participants and the particular needs of each. Robert’s preparation and knowledge of the workshop location made for a stellar experience for me and I hope to attend another workshop with him. There’s a lot packed in to this workshop. Sunrise and sunset shoots every day, with classroom sessions in between. Robert is meticulously prepared and knows the locations in detail. For example, after our sunrise shoot one morning, and before our afternoon classroom session, Robert hiked the trail for our sunset shoot – twice. Why twice? So he could set rock cairns for both the forward loop and the reverse path – just in case we had to leave that way. I found Robert to be thoughtful and focused on his students’ learning experience. He would remember questions asked of him, and come back to them again with a more complete answer later in the day or even the next day. Or share the question and answer with the larger group, if it seemed of broader interest. On site, he would wander from student to student, providing advice and support in a respectful and non-intrusive way. Like a good golf instructor, he knows how to focus the student’s attention to just one or two key issues, so the student maintains a creative mindset without going too much “in his head”. I’d never attended a photography workshop before, but I can testify that it’s a great way to learn. We seldom have the opportunity to fully immerse ourselves in our avocation for 5 full days, without distraction. For me, lessons in composition took on real meaning when I did my best to compose an image well, and got immediate feedback from Robert right there on site, before even snapping the shutter. Having an experienced and compassionate mentor, observing the same scene you do, but seeing so much more is truly instructive. I first learned about Robert Rodriguez Jr. on a B&H Event Space Seminar on YouTube. The seminar was titled “Insights Into the Art and Craft of Landscape Photography”, and I was drawn to his philosophy of capturing a meaningful image. 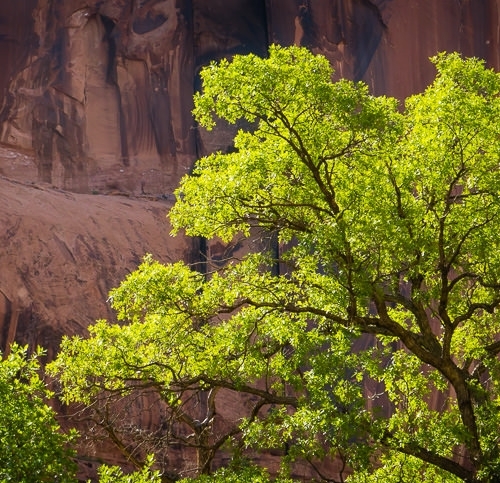 I went to his website and found the May 2015 “Spring in Arches and Canyonlands” Moab Workshop. I have wanted to go to the southwest, and Robert gave me the reason to make the trip. The workshop was wonderful and met all my expectations. My approach to taking a photograph has changed to “making images”. I now take fewer photos, and I’m much happier with those I do capture. How did this happen? It was with Roberts’s one-on-one instruction and coaching in the field as I was making an image. Robert helped me see the image in the view finder and capture exactly what was needed to reflect what I was feeling and seeing. I now take more time to study my subject and compose, which has resulted in less time needed in post processing, cropping out unnecessary elements. After the “Spring in Arches and Canyonlands” workshop I went to Monument Valley, Page AZ, Zion Nation Park and Bryce Canyon National Park. I felt a new confidence in my ability to capture the image that caught my eye, and I reinforced the instructions that Robert gave me. Like others I first learned about Robert online with his talks that he gives at B&H. Based on those talks and what I learned I began to follow Robert via his website and blog. I found his blog posts and insight to be very inspiring. When I learned that Robert headed up workshops I was definitely interested in attending. I took the plunge and booked the Arches and Canyonlands workshop. At the time I had no idea what lied ahead. I can truly say this was a wonderful journey I won’t soon forget. It was a mixture of beauty, learning, fun, exploration, and so much more. Along the way Robert did everything possible to make sure all of our journeys were smooth, fun, creative, and safe. His preparation and planning was flawless. This is evidenced by how smooth each day went. Even when the weather was a bit off, Robert knew how to switch gears and find places we could shoot that lent themselves to the conditions. During this trip I saw and photographed things that were beyond my expectations. Although this was my first time to the area, it definitely won’t be my last. To anyone considering going to one of Robert’s workshops that might be unsure or on the fence I tell you go! You will enjoy the journey and learning as well as the camaraderie of good people along the way. In Robert you will find someone who is thoughtful, genuine, and one who has a passion to teach. Because of my experience during this trip I definitely plan to attend another one of Robert’s workshops again in the future. Thanks Robert, I learned so much from this experience and hope to apply everything I learned from you as I go forward with my photography! 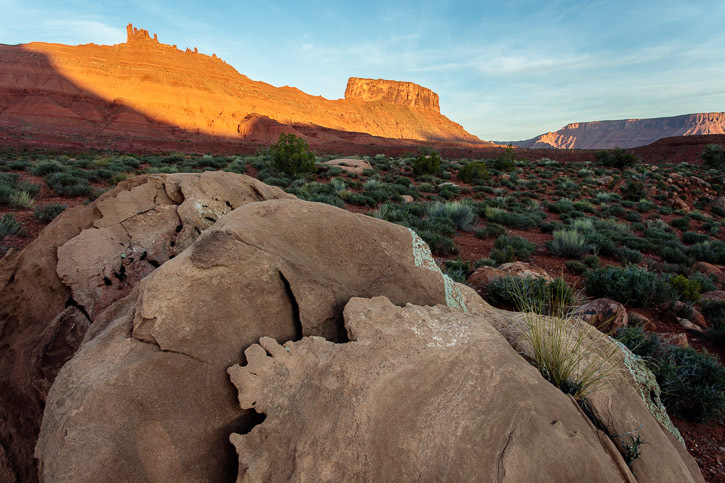 I Attended the Arches and Canyonlands workshop this Spring and the result was a definite advance in my photographic awareness and ability to create better images. Robert is a masterful teacher with a natural easy style. He does all he can to make the week’s experience work for all students. Personally, he showed me how to transform a so-so composition I was struggling with into one that engages the viewer by taking my camera and showing me a slightly different framing and position. I won’t forget that one minute lesson. This five day immersion in landscape photography featured loads of time in the field shooting and classroom time too, but the schedule was manageable and seemed to flow. The workshop was great practice for working on technical skills and was the best thing I have ever done to improve my photographic awareness and compositional abilities. On top of that, I learned a lot about myself during the experiences of the week. I highly recommend it. 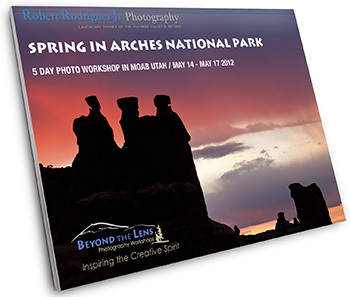 Robert’s Spring in Arches and Canyonlands workshop was everything I had anticipated and then some. A few months have passed since the workshop and looking back at the entire experience I can honestly say that it was one that I won’t soon forget. 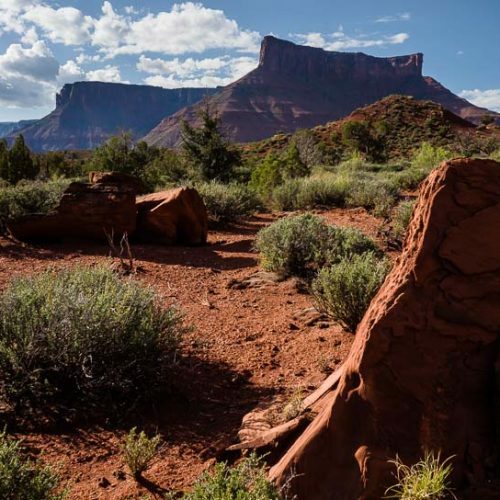 From the vast epic landscapes of Canyonlands and Arches to smaller more intimate scenes of the nearby state parks and trails, each outing felt entirely different from the previous and offered a unique look at one of the most beautiful areas in the Southwest. This diversity in locations is something that caught me by surprise and one that I appreciated tremendously. 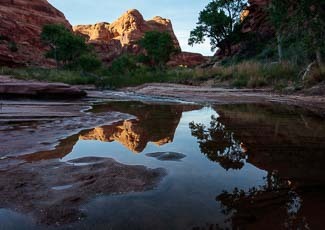 It was great to see and photograph some of the iconic locations of the two National Parks, but getting away from the crowds in the lesser known areas of Moab and its surroundings gave a deeper meaning to what we were photographing and allowed us to connect to nature on a much more personal level. Robert’s teaching approach emphasized this by giving each of us the freedom to explore the location and uncover what we personally found meaningful. He would work with each of us one on one to find compositions which best told OUR story in it’s most simplest form. At times I honestly felt that I was out on one of my own photo adventures and had the convenience of asking questions or getting guidance from a professional right there on the spot, not in a blog post or forum after the fact… this to me was priceless. I have never met someone with as much passion for nature and the creative process as Robert. His desire to tell a story through the lens is truly infectious and inspiring. You not only see this in the field, but in the afternoon lectures as well where he shares his thinking on his image making process and inspirations from other art forms like painting and music. To see the similarities of compositional elements such as lines, shapes, tone, and repetition and how we can use these in our own photographs to provide a clearer message is fascinating. All in all this workshop was one of the best experiences I have ever had as a photographer, creative, and nature lover. I am deeply grateful to have met Robert and hope to have the opportunity to attend another of his workshops in the near future. He has been a huge inspiration through his blog the past few years and has expanded my perception of nature and the creative process in ways unimaginable. It was so rewarding to join him finally on one of these memorable adventures. First of all I have to say “thank you, Robert” for having all these great workshops available and for being such an inspiration both in photography and in life in general! My first workshop with Robert was the Acadia Autumn Adventure in Oct. 2015. I had such an amazing time and learned so much that week, that I just had to come to this workshop. First of all, Robert’s passion for photography and education are so evident in the way he teaches and coaches students. Whether you have technical skills you need help with or questions about any aspect in photography, he is always available for guidance. In the field, he does not tell you how to set up a photo but rather allows you to create your own image and if needed, will help make the image stronger, if you feel you are not quite capturing what you envision. He does not hover over you but he always seems to be there when you need him most. That is the great thing about his workshops, the class size, truly allows for one to one coaching. The days are filled with learning. From sunrise shoots to midday class and back to sunset shoots, the learning continues throughout the day. Robert also has a gift to select amazing photographic locations and although we do go to the iconic spots in the area, Robert shows us that great photographs can be made in other parts of this vast beautiful landscape. Robert’s books: Insights from Beyond the Lens and Insights from the Creative Path both were so valuable during the workshop. Both books did give me insights about photography and being in the field and once in the field, Robert is there to clarify and reinforce what you learn from the books. I cannot recommend Robert’s workshop’s highly enough! I have learned so much from him and I do feel like my photography has entered another level. I have met some great people and made good friends. So, if you are considering one of these workshops, I think that any one of them you might be considering will be a great choice! Just got back from last weeks Spring in the Southwest workshop. I can’t recommend it enough. Robert is extremely knowledgeable about the area and about what makes a great landscape photo. The group is small enough so that Robert gets to know you and what you need to improve as a photographer. As mentioned we hit some of the well known areas in Arches and Canyonlands , but the out of the way areas really made the trip. Hope to do another in the future. I am so grateful to have had this photographic journey in a treasured part of these United States under Roberts guidance. Thank you for sharing your wealth of knowledge of landscape photography. The workshop was worth every penny and I saw my photos improve with each passing day! I brought home some photo treasures that I will savor throughout my lifetime. Roberts workshop in Utah was filled with fun and instruction from pre-sunrise to after sundown. We were lucky to have a fun group of photographers eager to learn and absorb the daily guidance that Robert provided. If I needed extra instruction, Robert was there to offer assistance at any time. The classroom work was also very constructive to photographers of all levels. Robert made sure to talk about issues and answer questions from the most simple to more complex. I highly recommend this workshop and ANY workshop that Robert offers for Landscape Photography. If possible, I plan to attend another workshop in Acadia and his printing workshop in a few years. Cheers to Robert! I learned a lot and it is evident in my photos! Just do it! My son and I had the pleasure of joining Robert and three other amazing people in Moab this year and all I can say is I wish I had done this a long time ago. This workshop was a true joy and I learned so much. Robert emphasizes fundamental concepts and then works with you to help you realize your creative vision. It’s more of a “teach a man to fish” approach that will help you feed, and create, for a lifetime. He won’t give you the “fish”, you will need to work for it, but put in the effort and the lasting rewards will come. This approach, coupled with his ability to read people and meet them where they are at, make Robert an exceptional teacher. I’ve read photography books, watched youtube videos, listened to podcasts, and visited forums but there is nothing as effective as receiving realtime guidance in the field from someone as skilled and personable as Robert. If you want to progress as a photographer, nothing beats this immersive experience. 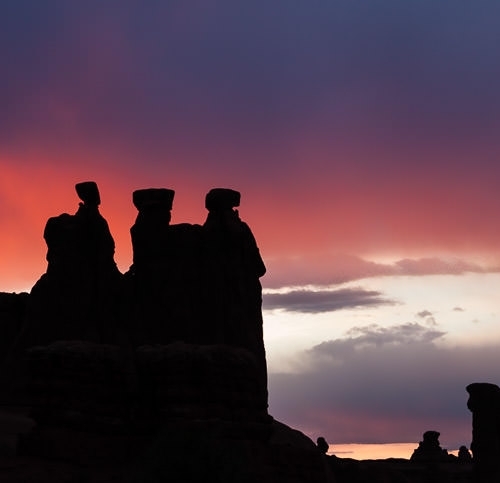 Add to this the fact you are in Moab with a group of fellow photographers eager to learn and share – it’s a great time. My initial exposure to the teaching style of Robert was during the Printing Masterclass. Interestingly I learned much about my approach to photography and my many opportunities to improve through his thoughtful guidance. In particular in the areas of composition and finding the visual ‘art’ . On the Moab trip I was able to advance my knowledge about the technical aspects of making an image and why composition impacts the final result. Elements of composition guide decisions leading to visually pleasing results and a true reflection of what you witnessed and experienced in the field. One of my goals has been to get my images off the computer hard drive and begin enjoying them with family and friends. Robert has the patience and skill sets to take your photography to a new level and deliver on tangible results. As said in a review above – do it! I had a truly extraordinary experience, in the deepest sense, during the Spring in the Southwest workshop. I love nature and I love the art of photography. I’m a desert rat by birth so I am naturally drawn to the magic of this part of the world where the forces of water and wind have so beautifully sculpted this ancient landscape, where first and last light turn on the glow of the rich color of the sandstone. Robert has done his research and is an excellent guide taking us to locations that offered a multitude of photography opportunities while avoiding the ever growing crowds at the iconic locations. The space Robert created with the workshop allowed me to be within myself in the most simple and profound way while learning about light and composition and further discovering my vision. Robert is fully dedicated to being with each of his students and committed to making his, (I can hear him saying he is going to plug his ears for this), creative genius available for his students to learn from. That being said, I feel his most powerful and effective talent as a teacher is gently guiding his students to discover our own path for discovery, passion and learning. Part of what attracted me to join this workshop was who I sensed Robert is as a human being, humble, passionate for life first, then learning and helping others learn, then photography. I believe the chemistry of our group was a reflection of these traits. We had such a fun and enjoyable time with each other and I am grateful to have made new friendships with five other wonderful people. The experience was trans-formative for my life and my photography. Give yourself a gift and take advantage of what Robert is offering, you will be grateful you did. I stumbled across Robert on Youtube. After I watched the 1st, video I continued to watch every video of Robert’s I could find. I felt his personality, teaching style and knowledge would help me to grow. I attended the “Spring in the Southwest” workshop in May of 2018. Thank you Robert for being an inspirational mentor for photography and modeling the attitudes needed for being successful in a creative life! The small class size allows Robert to give you one to one coaching that helps you make your image stronger. Even though we didn’t go into detail about LR functions, his presentation in the lecture part of the class made a significant difference in how I approach working with my raw files. I am currently going back over many of my favorite photos and reworking them using Robert’s approach and then comparing them. This showed me that I had done more editing work than was necessary on many of them. 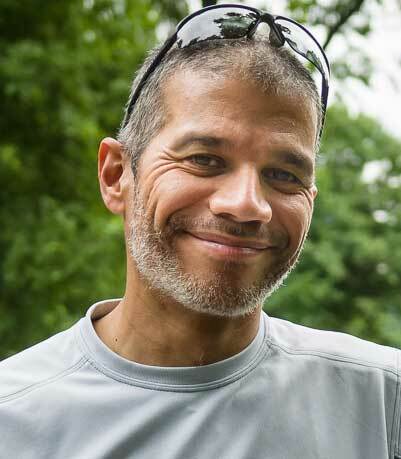 Robert has extensive and detailed knowledge of the parks. He also takes you to beautiful places away from the crowds where you can relax and not be dodging tourists while trying to thoughtfully compose your shot. Robert’s preparation and planning made the class fun, creative, safe and run smoothly. I highly recommend this workshop and ANY workshop that Robert offers!! !